What is a Window Buck? A window buck is a metal frame that is installed in the basement wall forms when getting ready to pour concrete. When the forms are removed, a permanent window opening is created. This opening will make your basement safer and allow light to enter the normally dark space. 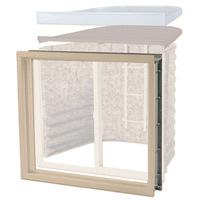 With this window frame, window wells are easily attached to the foundation. After the buck is set in place, basement escape windows are also installed with ease into the new opening. Window bucks make installation easier, faster, and safer. CK’s Windows & Doors offers the Easy Buck, which comes pre-manufactured to allow easy installation. Wood or aluminum forms and built-in exclusive fasteners are used to make adding an Easy Well a snap. The Easy Buck comes in many sizes to fit in any home and basement space. CK’s makes window buck installation fast and easy.